A stark contrast of white on black, with colorful splashes of a deep gray purple, green and orange, combine to create a truly mesmerizing WordPress church theme experience with this the second offering in our Genesis framework “Sanctify” theme series. With a central, intuitive layout, this new church template offering will prove as easy for your congregants and website visitors to use as it is for you to manage through the straightforward WP back-end admin. 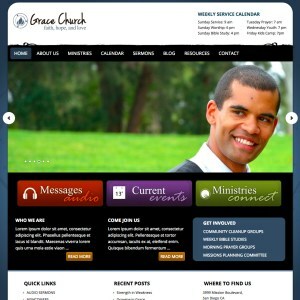 Being a fully responsive Genesis framework WP theme, your church website will look great on any web-ready device. With built-in features like the sermon organizer and events calendar, this is a theme customized specifically for the needs of churches. As with all of our premium themes, your download comes with each of the images and photos you see, as well as the full live demo install file.